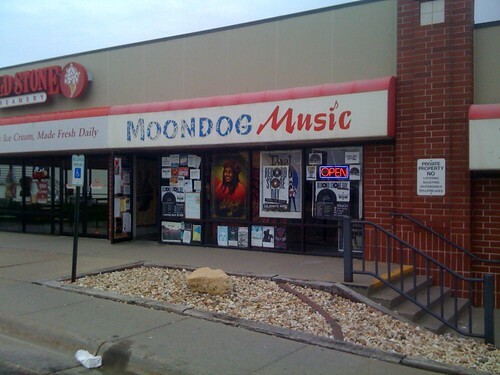 Published on June 2, 2009 in Bands/Artists, In The Bins, Music, Out and About and Vinyl. 0 Comments Tags: "thrill jockey", Blood on the Tracks, Bob Dylan, CD, Conshohocken, Crosby, Freakwater, IV, Led Zeppelin, Nash, PA, Peter Gabriel, record store, Stills, used, Vinyl, Young, Zoso. I was in Pennsylvania for work in March, and I typically stay at the Mariott in Conshohocken because it is very close to work. 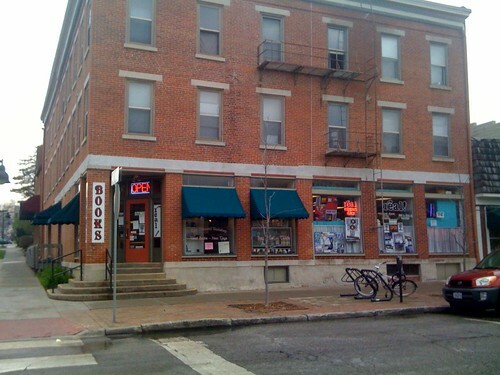 I had to stay over a weekend and happened to stumble upon a record store literally up the street from the hotel! 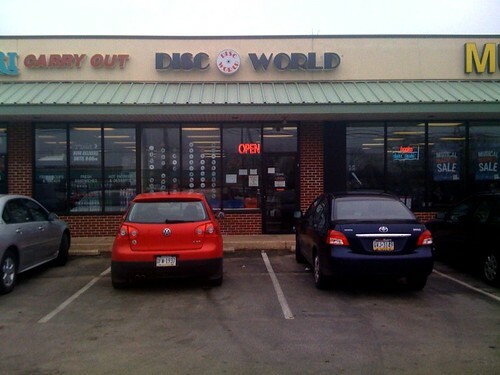 I was out for lunch with a co-worker when I spotted Disc World out the window of the restaurant. We decided to check it out. At Disc World you have the typical used CD selection, but you can also order new titles which is really nice in this day-and-age. They have posters and DVD’s as well as games. But, the real surprise was the two crates of vinyl at the front of the store! Even though it was a small collection– every piece of vinyl was in amazing condition. Michael Weiss told me that their vinyl buyer was really picky about what records he buys. He also said that he hadn’t intended to get into selling vinyl, but a good customer of theirs came in with a collection he wanted to sell. So, that is how they started. The crate had a lot of 70’s classic rock in it, and a substantial Doobie Brothers collection. I picked the best of what I was interested in, but I will be back! Thinking of You – Freakwater (CD, Thrill Jockey thrill 150, 2005)($5.99) Well, I can’t spot a Thrill Jockey release in the used CD bins and pass it up. This is the country folk project from Catherine Irwin and Janet Beveridge Bean. This is their most recent release produced by Tim Rutli from Califone and includes members of Califone as well. This album also includes James Elkington on “Double Clutch.” His participation was kind of a return-the-favor for Janet’s participation on the first Zincs record. Since then, Janet and James have formed The Horses Ha, whose album comes out this month. 4 Way Street – Crosby, Stills, Nash & Young (2 LP, Atlantic SD 2-902, 1971)($7.00) Wow! The cover is kind of worn, but the seams are all in tact. Includes original LP sleeves with other Atlantic titles. The vinyl is pristine! The label is a very vivid red and green. Fantastic live album. A must for any collection, really. (first self-titled, aka “Car”) – Peter Gabriel (LP, Atco SD 36-147, 1977)($3.00) Another cool release. I don’t have any proper Gabriel releases (I have a 2 LP bootleg). This is the first solo album post- Genesis for Peter, and includes the smash hit “Solsbury Hill” as well as “Waiting for the Flood.” Produced by Bob Ezrin. Cover art designed by Hipgnosis who does most of the Pink Floyd cover art. Super clean vinyl, edge wear on cover and seam split on inner sleeve. VI/ZOSO – Led Zeppelin (LP, Atlantic SD 7208, 1971)($5.00) Wow!! Hit the goldmine on this one. Very nice shape sleeve. The vinyl is immaculate. Has “Porky” / “Pecko Duck” scratched into the deadwax. According to this thread, generally accepted to be a superior pressing and probably first pressing. Gatefold in good shape and no seam splits. Inside record sleeve is in tact, too. Second Led Zeppelin release I have on vinyl. I have a Columbia House pressing of Physical Graffiti, too. Blood On The Tracks – Bob Dylan (LP, Columbia PC 33235, 1975)($5.00) Here is where I start my Bob Dylan vinyl collection. Brilliant divorce album from Bob– angry and all of that. Apparently recorded the album twice– once in NYC, and then re-recorded half of the record in Minneapolis at the suggestion of his brother. This LP is not a first-pressing, but is super-minty sleeve, record and inner sleeve. A prize piece for sure. A nice selection of classic LPs at a really good price considering the price-hiking that Half Price Books has been doing lately. I recommend stopping in at Disc World if you’re in the area. The Time to play b-sides archives for the bob-dylan tag.